Â Several years ago, I stepped into the Notre Dame cathedral in Paris and, looking up at an originalÂ rose window, I thought of the people who had dedicated so much time and material and artistic talent to construct the building, of the hundreds of thousands of people who have visited through the centuries seeking solace, sanctuary, and God, and of the French people today, whether believing Catholic or not, who are proud of their historic building. And I thought, this is a special place. Walking into the newly finished Oquirrh Mountain Temple built by the Church of Jesus Christ of Latter-day Saints and located right here in Daybreak, while it has neither the spaciousness nor extravagant decoration of the famous cathedral, I felt immediately that I was in a special place. Â Â Â Â With itsÂ faÃ§ade the color of dry native grassesâ€”comprised of Uinta gold granite from Chinaâ€”and straight-forward lines, the new temple reflects its arid valley setting and the hard-working, down to earth culture of the people around it. And yet it is breathtakingly beautiful. Â Â Â Â The prairie themed colors and no-nonsense architectural style continue in the interior. Gorgeous fabrics in muted browns, golds, greens, and cream complement the dark-stained oak woodwork and abundant brown limestone from Morocco and Egypt. 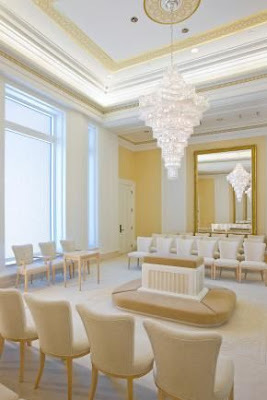 And although the 19,447 Swarovski crystals in the Celestial Room chandelier are imported from Austria, local artisans also helped furnish the Oquirrh Mountain Temple. Bronze handrails on the grand staircase are made from Julius Blum components forged in the United States. Fluted, struck with stars and bordered by circles, the fabulous art glass windows were brilliant cut by John Quist of Salt Lake. 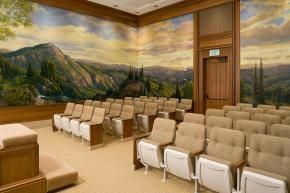 Local volunteers, asked on a special Church-service mission and supervised by Utah artist Linda Curley Christensen, hand-painted the lovely murals of Utah mountain country that appear in the upstairs instruction rooms. But best of all, a local landscape architect and Daybreak resident (my very own neighbor, in fact), Greg Boudrero with MGB+A designed the plantings on the grounds surrounding the temple. Â Â Â Â It struck me as I moved through the building that while the materials used in the temple are of the highest quality and the craftsmanship is evidently first-class, the space does not have a fussy, extravagant feeling. Beyond the many framed prints taken mostly from well-known LDS paintings and a few carefully placed vases, there is very little extra decoration. Clean-lined moldings and classic, contemporary furniture, including some very comfy chenille chairs in the upstairs sealing rooms, focus the space to its purpose. These rooms are meant to be used by hundreds of people every day. This temple is built for work. Â Â Â Â Once it is dedicated, Latter-day Saints view the temple as a sacred place, a literal â€œHouse of the Lordâ€. The Oquirrh Mountain Temple will not be a place for regular Sunday meetings but instead a place for LDS members to visit at special times, most notably to be married for time and eternity. Since Latter-day Saints believe that family ties extend beyond this life, the new temple will also be a place to visit anytime to perform services, such as baptism, vicariously for deceased relatives. And at times of personal difficulty, the temple will be a place to go for reflection and communion with God. Â Â Â Â Although the temple in Daybreak will be no different in purpose from the other 129 LDS temples around the world, and though there is nothing in design that this temple has that no other temple can boast of (sorry, folks, Elder Ballard personally squashed three unique things rumor), the Oquirrh Mountain Temple is special to locals because itâ€™s ours. Weâ€™ve watched it built up from a hole in the ground (remember that giant yellow box sitting on the hill? ), we watched as two cranes set the Angel Moroni statue on top, we get to participate in the open house and various accompanying functions, and when it is dedicated we get to visit as often as we like, many of us just walking down the street to the temple. A beloved place, indeed. Â Â Â Â Because of the sacred nature of the ceremonies and deep reverence for the house of God, only Latter-day Saints in good standing can enter the new temple once it has been dedicated in August. But all, and especially our neighbors and friends, are always welcome on the temple grounds anytime and particularly invited to step inside during the open house. If you havenâ€™t made arrangements yet to pay a visit to this beautiful, special place, please donâ€™t wait any longer. Drop by the Neighborâ€™s Tour on Saturday, May 23 between 8:00 AM and 12:00 noon (they expect 3,000 to 4,000 people on Saturday and say they are prepared for it) or make a free reservation for the general open house at www.lds.org/reservations before it fills up. Â Â Â Â Outside of Daybreak there are a lot of people taking interest in the new Oquirrh Mountain Temple. When it opens as a functioning temple on August 25, 2009, it will serve 26 stakes located along the western side of the Salt Lake Valleyâ€”thatâ€™s about 175 congregations or roughly 53,000 members of the LDS church. 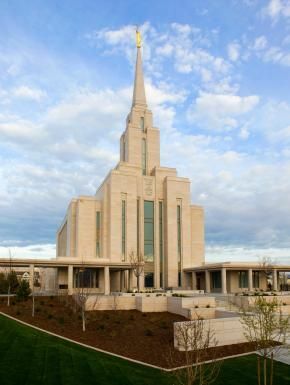 Even though at 60,000 square feet the new temple is not as large as the Jordan River Temple (South Jordan is the only city in the world with two temples) with two sets of instruction rooms and six sealing rooms it will be able to handle up to two thousand patrons a dayâ€”although itâ€™s not usual to see that many people at the temple throughout the week once the initial novelty wears off. The extra large brideâ€™s dressing room will accommodate the expected frequent weddings over the years as the areaâ€™s children grow upâ€”many choose the room they want to be married in as they go through the open house. While my school-age boys arenâ€™t at all thrilled at the prospect of seeing couples â€œkissing on the lipsâ€ on the temple steps, I hope to see brides taking wedding photos throughout Daybreak. What a beautiful place to have a wedding! Luckily for us Daybreak residents, most of these temple visitors will enter and exit from 4000 West after the open house. But maybe a few of them will trickle through the neighborhood, tell their friends about Daybreak and all those empty lots will finally fill up. Â Â Â Â Because of the beauty of temple buildings and their immaculately kept grounds, property values around LDS temples have historically increased or maintained high levels in locations throughout the world. As Daybreak residents who purchased their homes before the Oquirrh Mountain Temple announcement in October 2005 can attest, property values in Daybreak increased dramatically in anticipation of this new asset to the community. While current economic times and the deplorable state of the real estate market arenâ€™t helping anyone who wants to sell their home right now (and then thereâ€™s all those empty lotsâ€¦), we expect that as the community grows in, the temple becomes a fixed feature of the area, and the market eventually levels out we will see home prices in the area start to increase again. 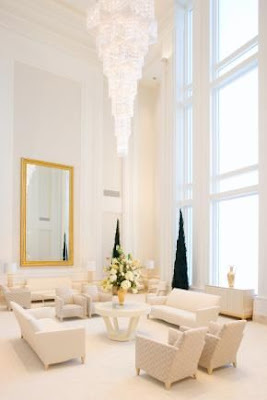 Â Â Â Â Built and furnished with careful craftsmanship, dearly loved by local Latter-day Saints, and valued for the classic elegance it brings to the community the Oquirrh Mountain Temple is most certainly a special place. Though I am not Catholic, I walked away from the Notre Dame cathedral with a better understanding of my Catholic friends back home, an opportunity to share a moment of real human conversation with my French hostess in spite of the language barrier, and a deeper appreciation of my own understanding of God. I hope that whether we belong to the Church of Jesus Christ of Latter-day Saints or not, as Daybreak residents living around the new temple we can all welcome this exceptional landmark to our neighborhood. For more photos and facts about the temple, visit the LDS Church's newsroom website here. No one could say what the three unique things are, just that there are three of them. If someone has any idea where this rumor came from and what those three things could possibly be I would love to hear about it. But since Elder Ballard (and the Chairman of Temple Construction as well) couldn't come up with anything, I guess we'll just leave it at that. Elly, very nice and well done. You have provided a very accurate and sensitive portrayal of something very spiritual, reverent, special, unique and exciting. I like how you juxtaposed your experience at Notre Dame to provide an introduction to something equally as meaningful and important to not only members of the LDS faith but the community as a whole. Again well done. Elly, as usual great atricale. But you have me curios, what were the 3 rumors that got squashed?